To be effective, conventional forms of sling protection must be of sufficient strength, thickness and construction. 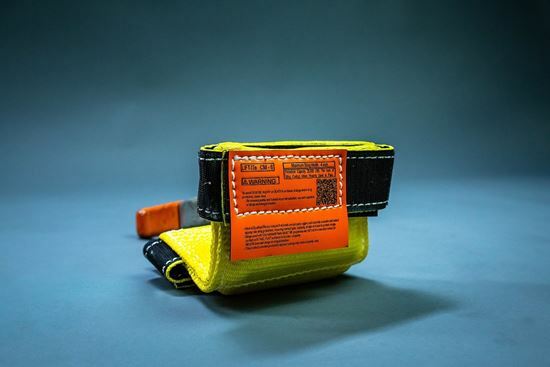 Traditional sling protection has always relied on these attributes to prevent damage to the sling because of direct contact with damaging load edges, corners or surfaces. 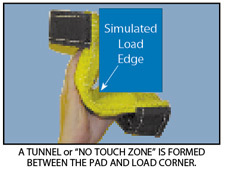 Patented CornerMax® Pads are truly remarkable because of the tunnel or "no touch zone" that is formed between the load corner and the CornerMax® Pad. The no touch zone greatly reduces the possibility of cutting. "Cut proof" sling protection does not exist. Note that the sides of the load must completely support CornerMax® Pads in order to create and maintain "the tunnel". CornerMax® Pad ratings are only valid if the 90 degree, CORNERED load fully engages the internal walls of the protector. * Use Rod Width for determining maximum loading. DO NOT use Pad Width. Please Note: CornerMax® Pads are 10.25 inches in length, unless otherwise specified. Do not exceed 25,000 Lbs. per inch of sling contact width. CornerMax® Pads are for use on 90 degree cornered Loads. All goods are custom made and Non-returnable. Any return must be negotiated, include a return authorization number and will be subject to a restocking fee. CornerMax® Sleeves are an ideal solution to protect slings from cutting when it is not practical to use protection that is based upon full, 90º, corner contact. CornerMax® Velcro Pads are an ideal solution to protect slings from cutting when it is not practical to use protection that is based upon full, 90º, corner contact. LB Series Lever Hoists offer low headroom and compact design that is perfect for use in tight quarters. Regarded as the best lever hoist in the industry, the LB Lever Hoist is recommended for use in heavy-duty construction, mining, manufacturing, shipbuilding and day-to-day maintenance and repair operations.